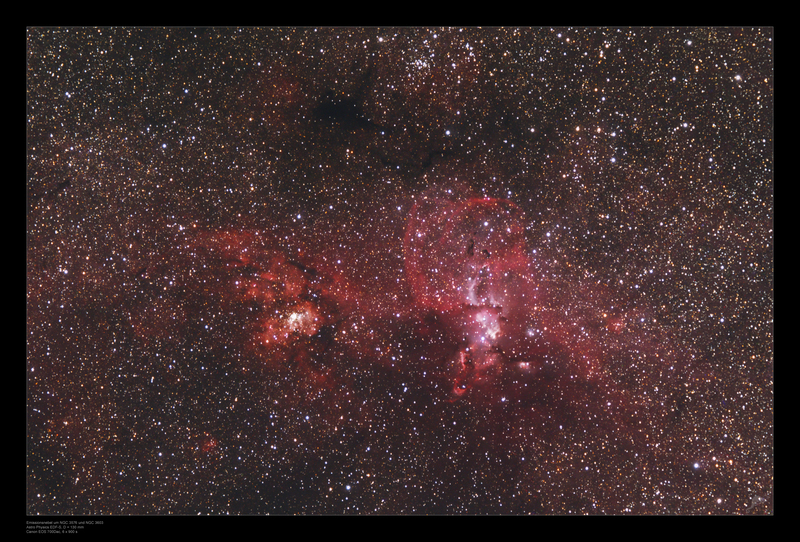 To the east of the Carina nebula, there are two other areas of star formation inside the southern milky way. 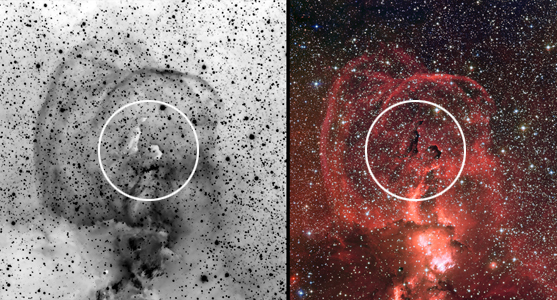 The nebula around NGC 3576 on the right hand side of the image is about 7800 light years away from the Earth. 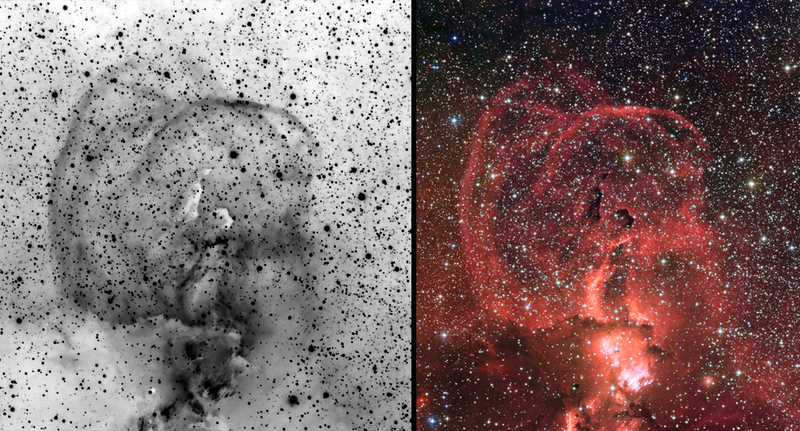 The two arched structures in the northern part of the Nebula are a very remarkable feature. The intensive star winds of the massive young stars in the center of the nebula produce the bubble-like structures in the gas clouds. The nebula Gum 38b (around the extremely luminous star cluster NGC 3603 on the left hand side) is about 23.000 light years away. 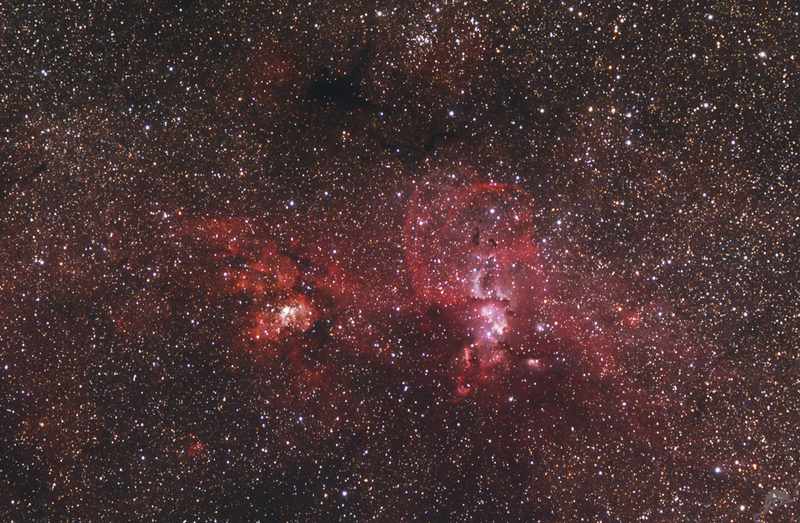 The color of the nebula is significantly shifted into a orange-reddish hue when it is compared to NGC 3576. This is caused by a more intensive interstellar absorption due to the longer light path. Click here or the thumbnail image for the object identification and a comparison with the size of the Moon. NGC 3603 is a very bright star cluster and is famed for having the highest concentration of massive stars that have been discovered in our galaxy so far. At the centre lies a WolfRayet multiple star system, known as HD 97950. 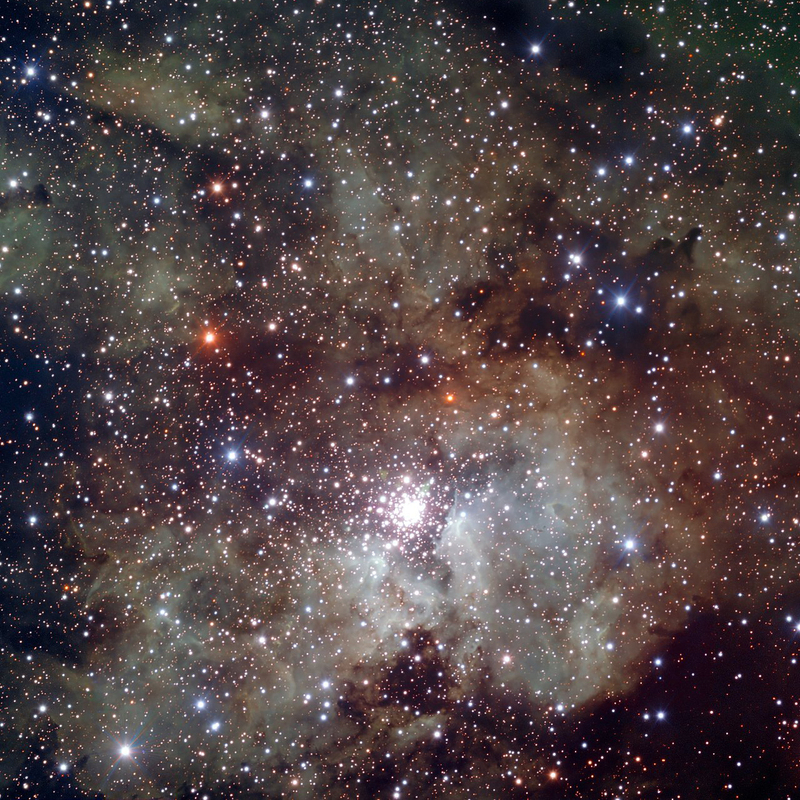 WolfRayet stars are at an advanced stage of stellar evolution, and start off with around 20 times the mass of the Sun. But, despite this large mass, WolfRayet stars shed a considerable amount of their matter due to intense stellar winds, which blast the stars surface material off into space at several million kilometres per hour, a crash diet of cosmic proportions. » NGC 3603 - Multispectralimage (V, R, I) FORS-Instrument at the VLT © ESO Click here or the thumbnail to see a large image. The cluster was first observed by John Herschel on 14 March 1834 during his three-year expedition to systematically survey the southern skies from near Cape Town. He described it as a remarkable object and thought that it might be a globular star cluster. Today we know that it is not an old globular, but a young open cluster, one of the richest known. NGC 3576 also lies in the CarinaSagittarius spiral arm of the Milky Way. 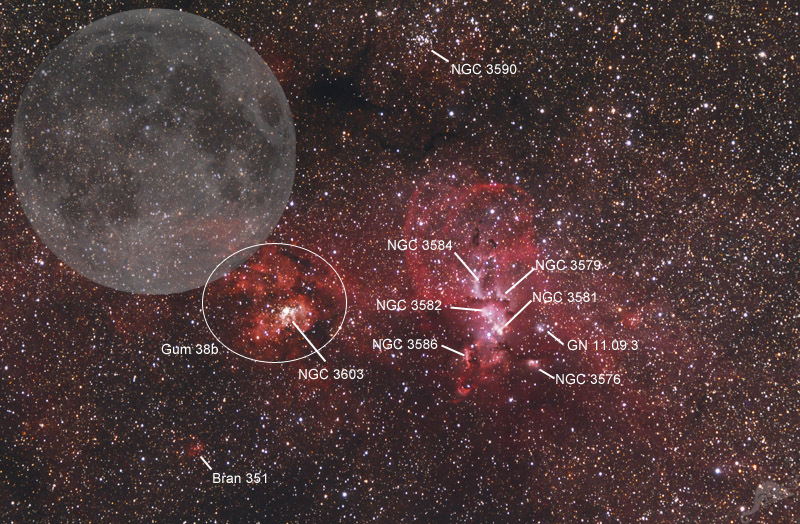 But it is located only about 9000 light years from Earth - much closer than NGC 3603, but appearing next to it in the sky. (BW-negative) was taken by us, using the 150mm Zeiss APQ, a SBIG ST-2000 (two images at 1.800 seconds) and a Baader narrow band H-alpha filter. 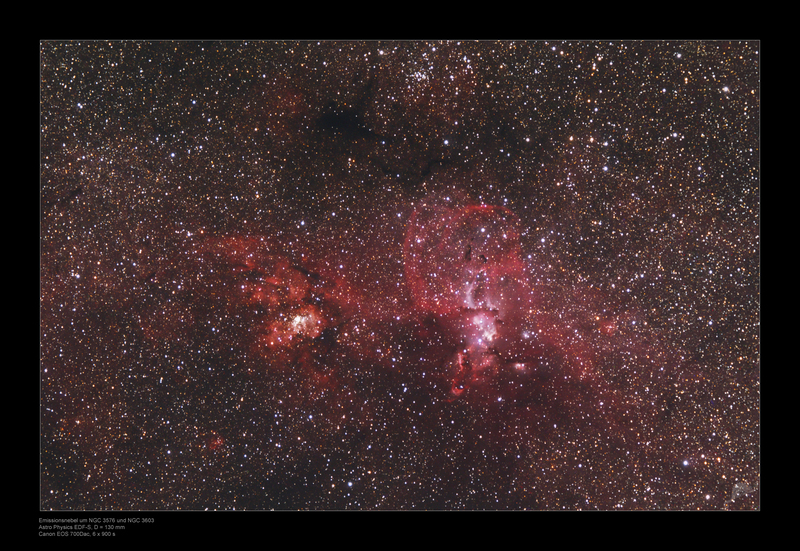 The colour version was taking with the Wide Field Imager-Camera at La-Silla-Observatory/ ESO aufgenommen (© ESO) Click here or the thumbnail to see a larger image. NGC 3576 was also discovered by John Herschel in 1834, making it a particularly productive and visually rewarding year for the English astronomer in South Africa.